Elegant, Roberto Coin, 18k white gold and diamond dangle earrings. This elegant pair of earrings is in excellent condition. Each earring measures 2" long x 1/4" wide it consists of the signature R. Coin Ruby and makers mark on the back. Gold is marked 750. Weight of the earrings is 9.34 grams. Earrings consists approx. 1.10ctw of diamonds. 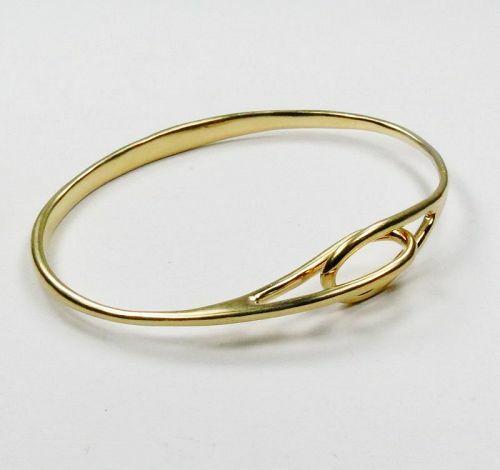 Elegant, Tiffany & Co. 18k yellow gold interlocking double loop bangle bracelet. 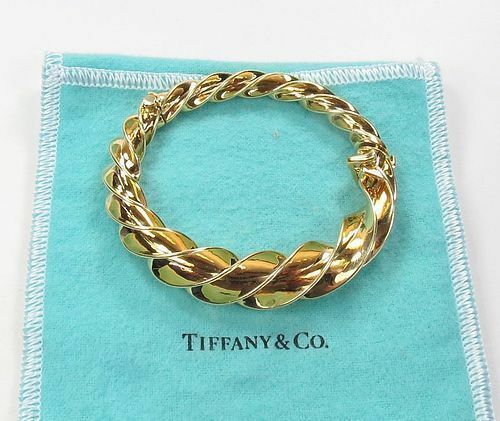 This authentic Tiffany & Co. piece is crafted from solid 18k yellow gold measuring 2 5/8" x 2" in diameter, (around 7"). Fully hallmarked and in excellent pre-owned condition. Weight is 22.14 grams. 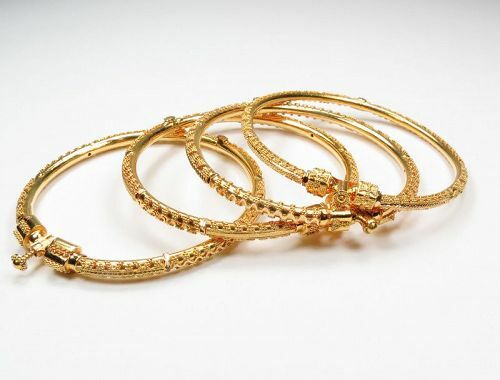 A fantastic pair of large dangle earrings, composed of 18k yellow gold, and approx. 20ctw. of natural moonstones with lovely blue undertone. These earrings are for pierced ears, measuring 3" long x 1" wide. In excellent condition. Gold is marked 750. Weight is 19.5 grams. Authentic 18k yellow gold Tiffany & Company Schlumberger Crazy Twist Bracelet. The bangle will fit a wrist size of 6-1/2 and measures approximately 2" x 1 3/4" in diameter and tapers from 1/4" to a 1/2" in width. Condition of the bangle is excellent. Bracelet is fully hallmarked and weights 66.08 Grams. This bracelet retails for $12,000. Hidalgo, band ring composed of 18k white gold, 0.12ctw diamonds and green enamel. This size 6.5 ring is 4.77mm wide. It is in excellent new condition. 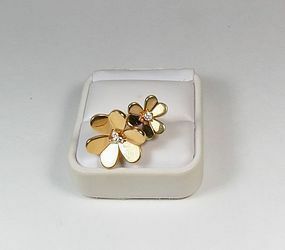 Wonderful, authentic, Van Cleef & Arpels 18k gold Frivole two flower ring with diamonds. Top of this size 6.5 ring measure 1 1/4" x 7/8", total carat weight of diamonds is approx. 0.35ctw G-H color. This exquisite ring is fully hallmarked VCA 750 52 BL 196012. Weight is 11 grams. There is little flexibility with the size because of the open design of the 2 flower ring. Elegant, Hidalgo, band ring composed of 18k white gold, 0.46ctw diamonds, blue enamel ring. This size 6 ring is 4.95mm wide. It is in excellent condition. Signed, Hidalgo, band ring composed of 18k yellow gold, blue enamel. This fleur de lis, size 6.5 ring is 4.83mm wide. It is in excellent condition. Fully hallmarked. Signed, Hidalgo, band ring composed of 18k yellow gold, 0.21ctw diamonds, blue enamel ring. This size 6.5 ring is 4.2mm wide. It is in excellent condition. 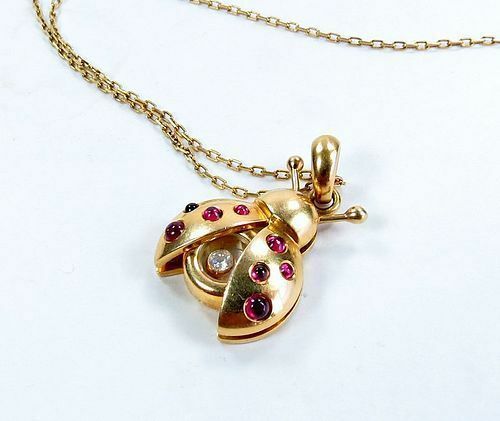 Wonderful, authentic Chopard, 18k yellow gold, ruby, happy diamond, ladybug pendant with 18.5" long, 18k gold chain. Adorable ladybug pendant measures 3/4" x 5/8", it consists 8 natural rubies of approx weight 0.20ctw and one floating 0.05ctw. diamond. Necklace is in excellent condition. Fully hallmarked. Weight is 7.1 grams. 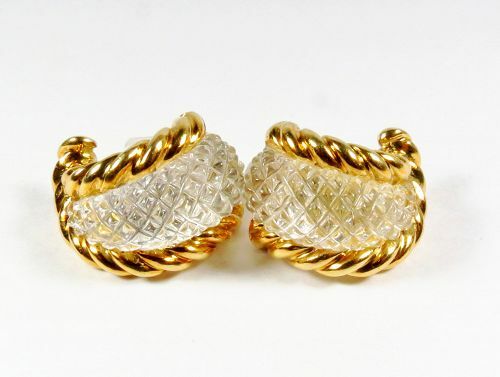 Iconic, Sabbadini Italy, large 18k yellow gold and carved crystal earrings. These clip on earrings measures 1 1/4" long x 3/4" wide. Fully hallmarked and in excellent condition. Weight is 38 grams. Highly desirable Cartier "Double C" bracelet, beautifully created in yellow, white and rose 18K gold. The bracelet is 15mm wide, is 6.2cm x 2cm in diameter and weighs 30.9 grams. 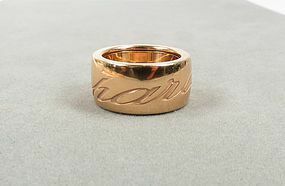 It is signed Cartier 750 449141. Condition of this elegant bangle bracelet is excellent. 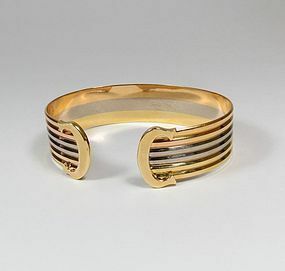 The bracelet would fit a range of wrist sizes from small to medium. 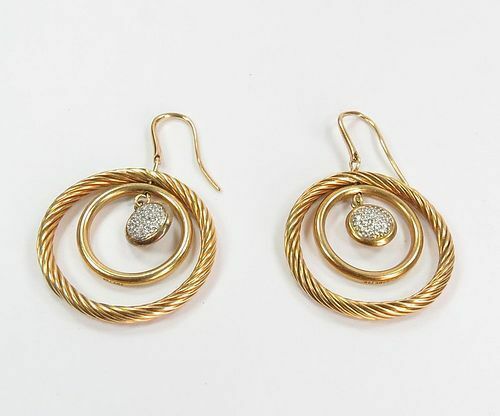 Retired, 18k yellow gold and diamond, dangle earrings signed David Yurman. These are in excellent pre-owned condition, measuring 1 7/8" long x 1 3/16" wide. Each earring consists of approx. 0.35ctw of sparkly diamonds. Weight is 14.1 grams. 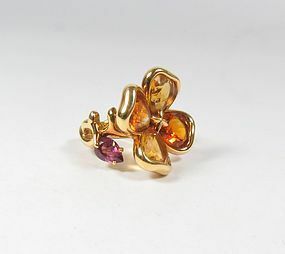 A fantastic, authentic Chanel Paris, 18k gold, citrine and amethyst flower ring from the famous "Camelia" collection. The ring is no longer in production, has been retired. Top of this wonderful, size 4.5 ring measures about 1" in diameter, (22mm). Ring consists of 4 natural citrine and 2 amethyst gemstones. It is in excellent pre-owned condition, marked Chanel 750 13C232 and French hallmarks. Weight is 14.8 grams.